We’ve built boots for over 40 years, striving and achieving our customers’ demands for increased comfort and protection. At Terra we understand construction, engineering and manufacturing sites. Terra works constantly to develop new component materials and advanced design constructions. Terra GORE-TEX boots are unmatched for waterproof protection. The VIBRAM logo represents decades of research and testing to improve traction and slip-resistance in the outsole. This is where the boots’ ability to perform really counts. The Terra FIRMA-FLEX system delivers lightweight flexibility and strength for less fatigue and more versatility. And when the day’s work ıs done, our CLEANFEET treated fabric liners, ensure the boots are odor-free and fresh for another day’s work. 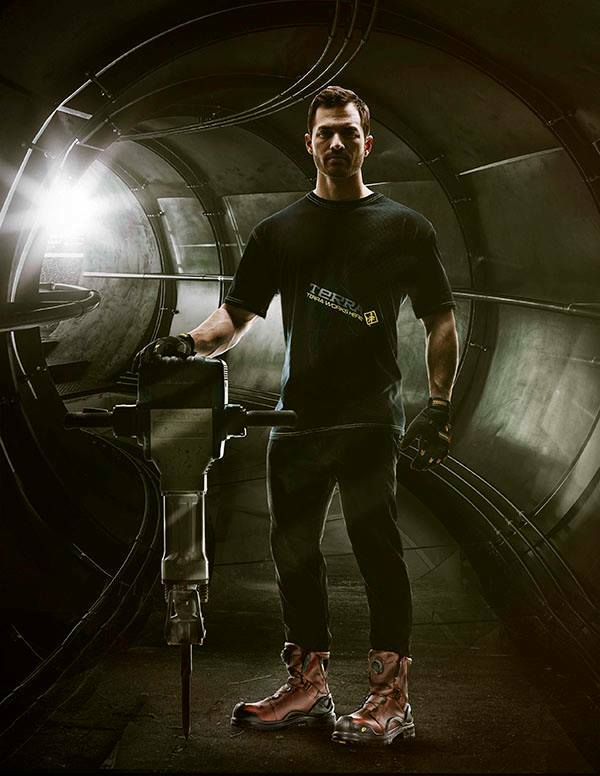 There’s a reason Terra Safety Footwear is worn on unforgiving, hazardous work-sites around the globe. We make the world’s premium work boots, and we work every day to make sure that doesn’t change. CleanFeet is a game-changer in the footwear universe. This patented technology doesn’t just eliminate odour – it actually prevents odour before it starts. Built into the fabric of your workboots, CleanFeet stops odour dead in its track. Safe and natural, CelanFeet is environmentally friendly and guaranteed for the life of your workboots. Our trademark lightweight metal-free technology delivers some serious heavy-duty protection. This revolutionary combination of super-weaved high tensile fabric and resilient polymer compounds makes for one tough toe-cap. The sole plate, constructed of laminated layers of this extraordinary composite, is even stronger: averaging 20% more resistance than traditional steel plates. Over time, Firma-Flex even contours to form perfectly to your foot. Terra-ized leather represents the quality standard that TERRA has set for all its leather suppliers. Each and every lot of leather we receive undergoes several visual inspections prior to being sent into production. In order to be classed as Terra-ized leather, swatches from each lot must exceed 30,000 Maeser flexes without any material breakdown or water penetration. Vibram is well recognized for performance rubber outsoles, and has over 70 years experience in developing a variety of compounds suited to a multitude of environments. Gore-tex waterproof membranes are used to keep your feet dry. With billions of microscopic pores, these membranes allow perspiration from your feet to escape, while blocking the entrance. Cambrelle lining provides superior moisture management, comfort technology and abrasion resistance. These elements are fundamental for all day performance. Our new sole plate innovation brings greater safety to the wearers of our new TERRA Vigour and Vapour athletic styles. The new technology being introduced by Terra offers a 42% increase in surface protection. When the load resistance of the TERRA Elite 5+2 layer composite sole combination is measured against the traditional steel plate it shows a 64% increase in penetration resistance.